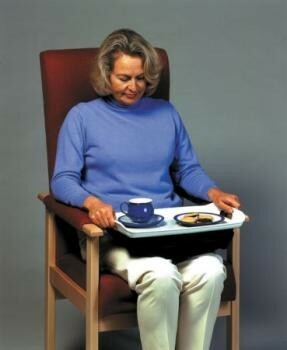 This tray has a bean bag attached underneath to allow it to sit comfortably on the knees in a very stable position. Ideal for use when sitting in a chair or bed. This tray has a bean bag attached underneath to allow it to sit comfortably on the knees in a very stable position. Ideal for use when sitting in a chair or bed.The detachable bean bag has an attractive washable cover. Tray size 445 x 330mm (171/2 x 13").